It’s good to have a better protection plan for your computer or other devices that you rely on to save all your crucial documents, files & folders. McAfee is a known manufacturer of delivering range of high quality PC protection software that makes your PC always secured, far ahead from any online or offline threat, and protects you while surfing over web etc. Full proof protection from range of Trojans, viruses, spyware, rootkits, malware or other malicious threats etc. Works effectively with both Desktop & Laptop. It incorporate advanced scanning engine that scans & remove threat more quickly by consuming lowest resources and power supply from your Laptop. State of the art file encryption mechanism to make your confidential files secured to prevent unauthorized access. It includes protection plan to protect your social network profiles which eavesdropper often finds lot easier to get access on and leak your private pictures or bank account details. You can also use free URL shorter service inbuilt into this mightiest utility to spread news or events securely. Make your wireless network super secured and protect files from unauthorized access while using open wireless network. Heal any minor or major security breaches on your Windows PC. Speed up your PC with unmatched PC optimization utility. Permanently delete confidential files & folders such as documents, pictures, videos etc. McAfee Total Protection includes everything you need to be secured 24 * 7. You can purchase 1 year license that will works with up to 3 PCs, at most 70% discounts. 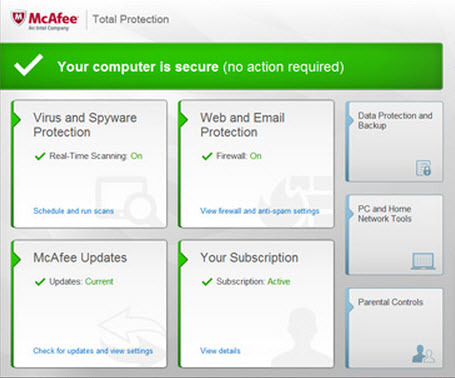 McAfee has 30-Day money back guarantee, free support across all around the world.